This clear stamp set contains 6 sets of words in a variety font. Suitable for a variety celebrations and occasions when you need to tell someone they are in your thoughts. Sizes of stamps vary from 3.5 x 2.75 cm to 8.5 x 1.5cm. 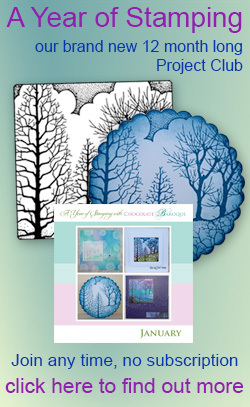 I purchased the Thinking of You Clear Stamp Set. 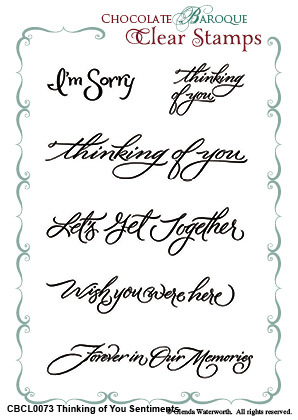 I had been searching for a particular sentiment stamp but didn't come across one with a font that I liked.....until I discovered this one at the Chocolate Baroque web site. The font is a lovely script font and I love it. 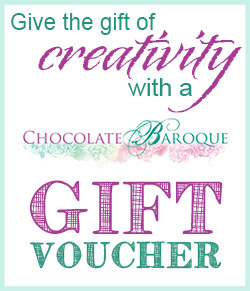 I will come back to the Chocolate Baroque web site often to check out their products.